The company behind a new UK nuclear power station says “no formal decision” has been made over its future following a report construction would be halted. The Nikkei Asian Review reported Hitachi’s board would be likely to decide to suspend all work on the Wylfa Newydd plant on Anglesey next week. 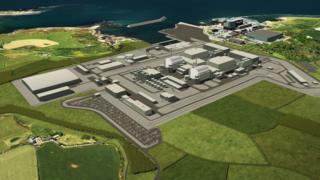 In December, the firm said it would do its utmost to ensure the £20bn nuclear power facility went ahead. A statement from the Welsh Government described the report as “worrying”. “This is a major project with significant economic benefits to Wales and rest of the country,” the statement said. Speculation has been mounting that Hitachi will scrap the Horizon nuclear power plant project due to potential increases in construction costs. Anglesey’s Welsh Assembly member Rhun ap Iorwerth said Hitachi appeared to be “closer to a decision on Wylfa not progressing”. “The signs aren’t looking good,” he told BBC Wales’ Good Morning Wales. Anglesey MP Albert Owen told BBC Radio Cymru he wants to know from the UK government “what is going wrong” and “why these questions and fears are being heard”. The UK government had been in formal negotiations with Hitachi over the project since June. But when British and Japanese prime ministers met on Thursday, they did not discuss the latest on the nuclear power plant. Japan’s Shinzo Abe said: “On the Horizon nuclear power plant project, this is a project which is of strategic importance for both nations. “I do understand that stakeholders including Hitachi are currently discussing this matter and I will wait until they come to a conclusion. Speaking on Friday, Wales’ former first minister, Carwyn Jones, said he found the developments worrying. “What is troubling me this morning, having heard that news, is this is a case of the UK government being so focused on Brexit that they are not focused on other issues,” he said. Sue Ferns, of the union Prospect, echoed worries that the issue of nuclear power was not raised when Mrs May and Mr Abe met. “The Japanese prime minister was in Downing Street only yesterday – did the prime minister even think to raise the issue of nuclear new build or was the only thing on her mind the chance to take advantage of his visit to try to give another futile boost to her Brexit deal?” she added. Peter McIntosh, national officer for energy at the union Unite, said: “Government must take action now, because if the project does not proceed, it will have a devastating impact on the Welsh economy and on the UK’s ability to meet its climate change obligations. But new first minister Mark Drakeford said that while the situation was worrying, “it’s still speculation”. Dylan Morgan, from Pawb (People Against Wylfa B), said the government now needed to focus on alternative plans for energy. A spokesman for UK government’s Department for Business, Energy and Industrial Strategy, said: “Negotiations with Hitachi on agreeing a deal that provides value for money for consumers and taxpayers on the Wylfa project are ongoing. On Friday, the firm said suspension of the project remained an option. But it said the latest news report in Japan were not “based on Hitachi’s decision or disclosed information”. “No formal decision has been made in this regard currently, while Hitachi has been assessing the Horizon project including its potential suspension and related financial impacts in terms of economic rationality as a private company,” it said in a statement. The new nuclear plant would aim to have a generating capacity of 2900 MW by the mid 2020s and have a 60-year operational life. Shares in the Japanese company jumped 8% after the report the project would be suspended. It comes weeks after fellow Japanese company Toshiba announced plans to wind up its UK nuclear business after failing to find a buyer, dealing a potentially fatal blow to plans for a new nuclear power station in Cumbria. The original Wylfa nuclear plant near Cemaes closed in 2015 after more than 40 years’ service.